Job growth should average 160,000-180,000 the rest of the year. The economy added 163,000 jobs in July, its fastest rate of job growth since February. While this number was somewhat higher than consensus predictions, it is consistent with the decline in weekly unemployment claims in recent weeks to levels that are near the low-point for the recovery. The unemployment rate edged up to 8.3 percent. Manufacturing again played a leading role in job gains, adding 25,000 jobs in July, slightly above its 19,000 monthly average over the last year. This number was inflated somewhat by a 12,800 gain reported in auto manufacturing, since this likely reflects changes in the timing of retooling shutdowns. Retail and construction employment were both close to flat. Given recent data in both sectors, it is likely that job growth will be somewhat better in the months ahead. Health care added just 12,000 jobs in July after adding 11,300 in June, well below the average of 25,000 for the last year. If this slowdown continues, it might mean slower cost growth in health care, but it also means that a major source of job growth in the recovery has been weakened. Educational services added 18,200 jobs in July, which reversed the loss of 15,200 reported in June. Clearly this is a seasonal issue. Restaurants added 29,400 jobs, a bit more than the 24,000 average over the last year. The broad temporary help sector added 21,800 jobs on top of the 22,200 jobs added in June. This is good, but not spectacular growth from a sector that is viewed as a harbinger of future job growth. The government sector lost 9,000 jobs in July, the same as in June. It appears that job loss in the sector is finally slowing. 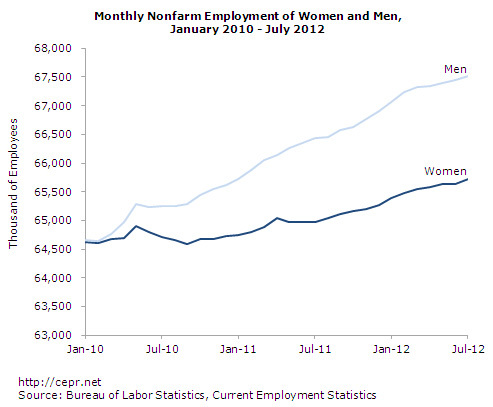 Women accounted for more than half (86,000) of the jobs created in July, but we continue to see unusual patterns. 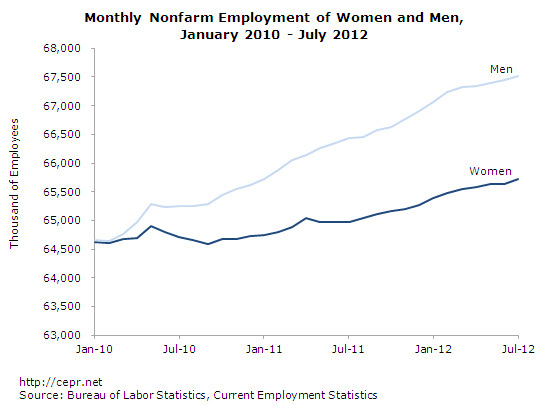 For example, jobs held by women in retail fell by 3,100, while jobs held by men went up by 9,800. The average hourly wage has increased at a 2.0 percent annual rate over the last quarter, slightly above the 1.7 percent rate for the last year. The household data were mixed, but showed a somewhat weaker picture than the establishment survey. Corresponding to the slight rise in the unemployment rate, the employment-to-population ratio (EPOP) fell to 58.4 percent, just 0.2 percentage points above the low for the downturn hit last summer. The EPOP for white women fell to 54.6 percent, a new low for the downturn. However, not all the data in the household survey were bad. The EPOP for black teens rose to 18.5 percent, the highest level since January 2009. This number is highly erratic, but it is still a positive sign. In addition, all of the unemployment duration measures fell sharply. The average duration of unemployment spells fell by 1.1 weeks to 38.8 weeks, while the median fell by 3.1 weeks to 16.7 weeks, the shortest duration since August of 2009. The share of long-term unemployed fell to 40.7 percent, the lowest since December of 2009. Also the number of discouraged workers fell sharply from its year-ago level. On the negative side, the survey showed a continuing rise in the number of involuntary part-time workers to a level 527,000 above the March level. And the share of the unemployed who voluntarily quit their jobs continued a downward trend from March. The main news in this report is a marked upswing in the rate of payroll job growth. The 163,000 rate shown in this report is likely too close to the economy’s underlying growth rate at this point. Many analysts became overly optimistic as a result of the weather-boosted jobs gains last winter. They then became overly pessimistic as a result of the payback in the spring as employment growth that would ordinarily take place in these months had already occurred. With construction getting stronger and retail sales likely improving in the fall, it is reasonable to expect job growth in the range of 160,000-180,000 over the rest of the year. This is better than the last few months, but it will take a decade at this pace to make up the jobs deficit.